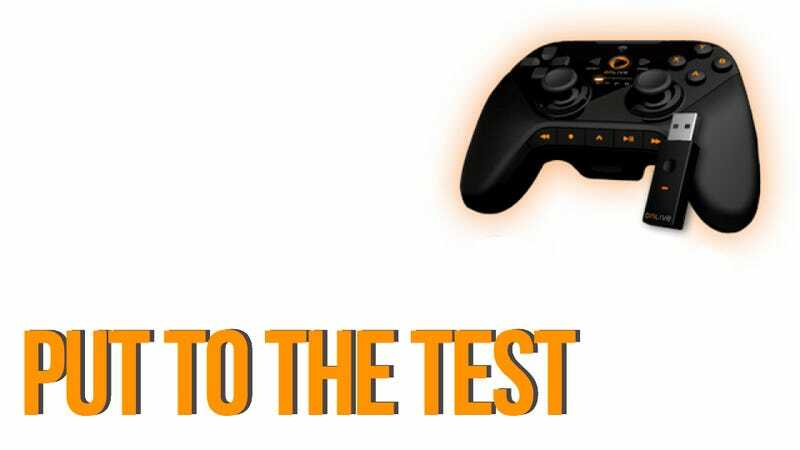 For much of the past week, I've been test driving OnLive's new app and controller pairing. The tech on display impressed me with the response time and the simple fact that, all of a sudden, the gaming options on an iPad are approaching parity with what you can get on a PC. Let's get one thing straight: OnLive cloud's service on tablets isn't going to replace a PC, Xbox 360 or PS3. Those native experiences remain the standard for many gamers and rightly so. But no one can deny the impact of having AAA releases, many of them out the same day they hit retail shelves, on the same tablet you use for e-mail, Angry Birds or reading books. I've been running games like Dirt 3, Red Faction Guerilla, Trine and Batman: Arkham City via OnLive over the Gawker office wi-fi and every time someone's walked by they've been wowed. Like all things pertaining to OnLive, the experience rises or falls on the strength of the internet connection available to you. As of this writing, the Kotaku internet connection's running at 28.55 mb/s for download and 21.35 mb/s up. That's a business connection, of course. As for my home connection, living in New York with ISP monopolies by Time Warner and Cablevision isn't great. A speedtest this morning yielded results of 6.96 mb/s down and 0.45 mb/s up in my apartment. So, obviously, the experience at work is better. What surprised me, though, was that the experience at my place still good. The initial load took longer and the graphics did degrade a bit, but a game like Dirt 3—with physics, particles and speed simulations running under the hood—still felt great. Sure, Dirt 3 may run natively at 60 frame per second but a slight dip to 50 fps isn't a dealbreaker. The Bluetooth connection from OnLive's special controller to iPad never dropped and I never felt like my reaction time was hampered by the streaming. I could pull off 15-hit combos in Arkham City on my iPad just as easily as on my Xbox. The Vpad overlay that you can use isn't any better than other virtual controllers to be found on other games. It's a bit busy and the face button layout could be better at mimicking the diamond layout on most gamepads. But, again, it's responsive to the point where you have to concentrate to find the lag. You may notice that framerate dip but, overall, it doesn't break the experience of playing the game. One caveat is that you can't pause the OnLive App; quitting it ends your session so you'll need to save before checking e-mail or some other function. OnLive's got some infrastructural advantages, though. You can start a game on tablet or smartphone and continue on PC or through a TV connected to their microconsole. The OnLive app's already live on the Android Market and should be hitting Apple's App Store soon. If you already have an iPad or an Android tablet, OnLive's latest move demands checking out. After all, which one would you rather play the next time you're stuck in an airport far away from your console or PC, Cut the Rope or Darksiders? You know the answer. OnLive's prospects will only get better as time goes on. Next-gen broadband like Verizon FiOS and 4G LTE cellular networks are making faster speeds accessible in the home and on the move. Tablet hardware's going to get better, too. I've loved the experience I've had with OnLive on iPad. I wouldn't say it's worth getting a smartphone or new tablet for but I would recommend it to anyone who's already got a compatible device. Starting tomorrow, you'll be able to play Batman: Arkham City on your iPad. No, not Arkham City Lockdown. The real one, the big-boy PC version. It's happening courtesy of OnLive and it's impressive enough to make you consider trading in your Xbox 360 or PS3 for Apple's lightweight tablet.